Have you ever needed a photo or illustration and gone onto Google, found exactly what you need and then used it in your blog, website, artwork or publication? Did you check first to see if you are actually allowed to use it? Did you credit the photographer or ask for their permission to use it? Or did you just grab and go? It’s so easy to do just that....grab and go....but it’s not necessarily the safest (or karmic) way to go. Something I’m always cognizant of is copyright issues. Who owns images? Where can I find “free” images to use? How do I credit the artist? Do I HAVE to credit the artist? How can I find the copyright information about an image I want to use? How do I know what my rights are as an artist? 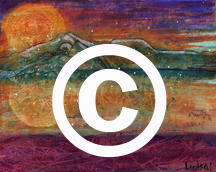 What is Creative Commons? All these things I need to know so I can teach my students what to look for and what they can and can’t use. It’s probably a good idea and good practice to educate yourself and know the ins and outs of copyright. Some terms used: exclusive rights, limitations and exceptions, creative commons, public domain. If you’ve never heard of them before and you’re contemplating using an image you found on the internet research, read, learn and respect the issues and what can happen. I have rounded up a number of articles and resources about these issues and how they can affect you. 5. You Mean I Can't Use an Image from Google Images? This is an excellent article about what can happen if you grab and go from Google. There are websites that share photos for free and free to use and modify. I’ll post some links for some of them in another post. I’ll also include a tutorial for finding copyright free images using Google so you can search for images and know you’re not infringing on someone else’s rights. For now, read up on copyright issues and pass your new-found knowledge on. it's so easy to pull images right off Google. I think most people think "ah, it won't matter, no one will find out." and that may well be true but it's still theft. There ARE lots of places that freely give their images (sometimes they ask for credit but that's easy to do) so it's good practice to start finding images from sites that are sharing without copyright issues. Creative Commons is a good place to go too.